(Photo: Vatican Media)Pope Francis celebrates mass at Rome's Regina Coeli prison on Holy Thursday, March 29, 2018. Pope Francis has washed and kissed the feet of 12 prison inmates, including two Muslims and a Buddhist, in a Holy Week ritual after saying the death penalty should be abolished because it is neither Christian nor humane. He spoke of the death penalty just before leaving the prison, a former 17th century Catholic convent that was transformed into a jail 1881, Reuters news agency reported. "A punishment that is not open to hope is not Christian and not humane," he said in response to closing comments by the prison director, a woman. "Each punishment has to be open to the horizon of hope and so the death penalty is neither Christian nor humane," said the 81-year-old pontiff. On Good, Friday, the day Christians believe Jesus was put to death by crucifixion, the Pope led services under tight security, urging people, including ministers of his Church, to rediscover the capacity to feel shame for their role in the world's ills. "Shame for all those people, including some of your ministers, who let themselves be deceived by ambition and vain glory, forgetting their dignity and first love." 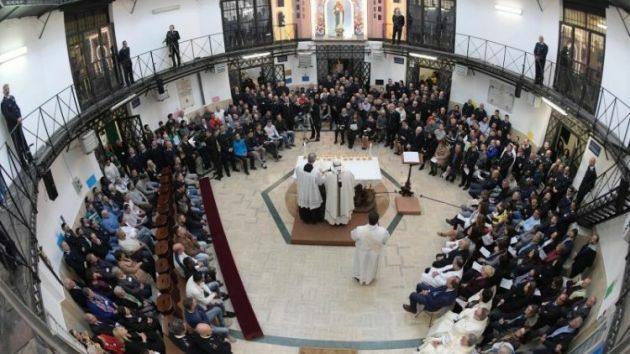 For a sixth successive year, the Pope had held the ritual on Holy Thursday in an institution rather than in the comfort of the Vatican or a Rome basilica, as did his predecessors, when he visited Rome's Regina Coeli prison. Reuters reported that conservatives have criticized him for including women and non-Christians in the rite in the past. Regina Coeli is Rome's oldest and best-known prison, housing inmates from more than 60 different nationalities. It is situated near the Vatican, along the banks of the River Tiber and was built on the site of a 17th century convent that was converted into a jail in the late 19th century. Like other prisons in Italy, it has made news headlines for problems of overcrowding and high suicide rates, Vatican News reported. During his visit, Francis greeted inmates, visited the sick in the prison infirmary and met prisoners held in a section for those needing special protection during their incarceration. The Pope brought up a passage where two disciples "who wanted to climb the corporate ladder" asked Jesus to give them the most important places, reported Vatican News. After looking at them with love like he always did, Jesus told them they didn't know what they were asking. He described what those in positions of power do: "command and make others serve them." In thinking of past times, Francis said there have been many kings and cruel people who have made slaves of other people. But Jesus says it must not be this way with us. "The one who commands must serve," the Pope said. "Jesus overturns the historical cultural habits of that time, but also of our own day." If only the kings and emperors of the past had understood Jesus' teaching and had served instead of commanding and killing, "so many wars would never have happened," Pope Francis observed. The 12 male inmates were from Italy, the Philippines, Morocco, Moldavia, Colombia and Sierra Leone. Eight were Catholic, two were Muslim, one was an Orthodox Christian and one a Buddhist. Since his election in 2013, Francis has several times called for an worldwide ban on capital punishment, prompting criticism from Christian conservatives, particularly in the United States.